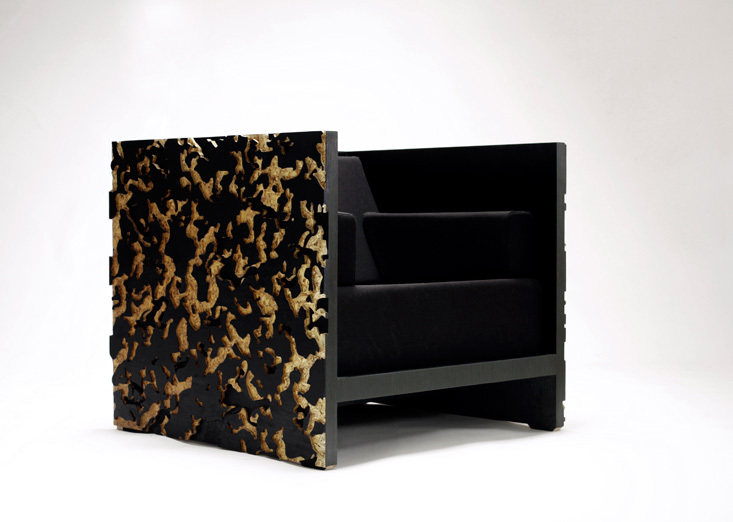 Camouflage is a low, individual sofa made from OSB. The material is surfaced with a stained-black veneer, and has oversized lateral panels that partly hide the user. These panels feature a carved camouflage pattern that emphasizes the trench-like character of the piece, but at the same time expose the OSB beneath. As a window of truth, the carved texture denounces some manufacturers’ pretensions when veneering particleboards with seemingly elegant wood textures, as well as open the discussion for the birth of new aesthetics using new materials. Many board materials, such as particleboard, OSB and plywood, are commonly used for tabletops, back panels and other furniture components. They are however, rarely left visible, as manufacturers cover every exposed edge or face with wood veneer, plastic laminates or paint. This is one of many techniques used to hide the fact that cheaper or less traditional materials are used, pretending that the piece is more expensive or refined. 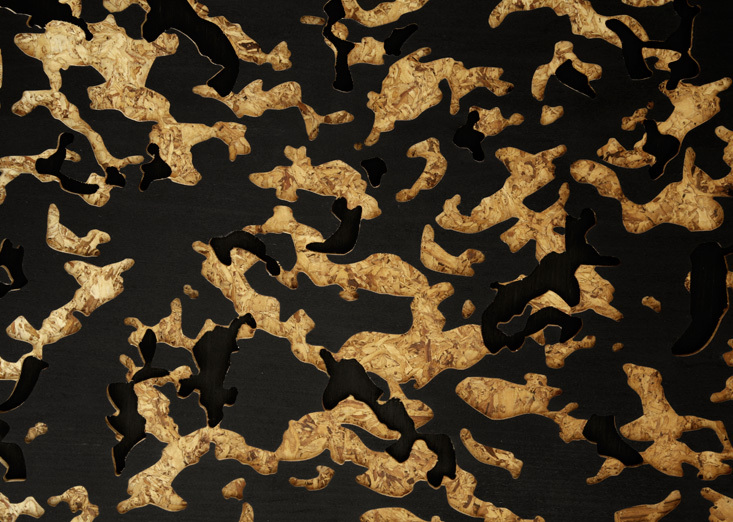 Analogous to a camouflaged battledress, this concealment expose a lot more about the subject when discovered. It’s the moment when a pretension becomes a confession, about who we want to be, or what we aspire to have. 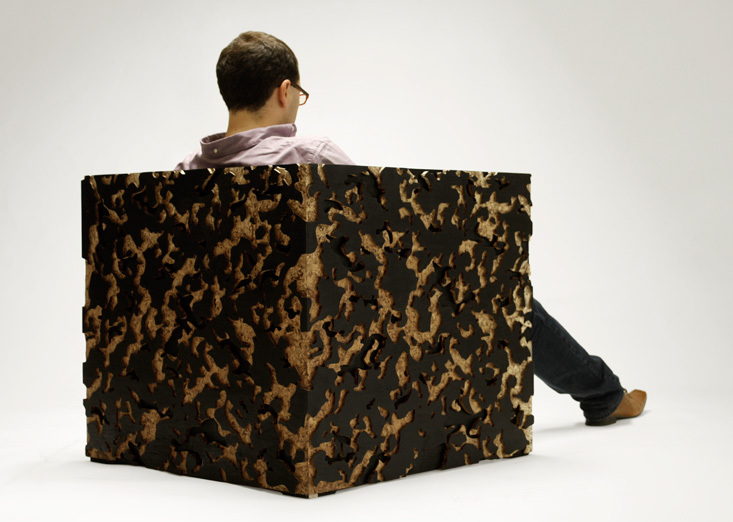 “Camouflage” is a low, individual sofa made from OSB. The material is surfaced with a stained-black veneer, and has oversized lateral panels that partly hide the user. 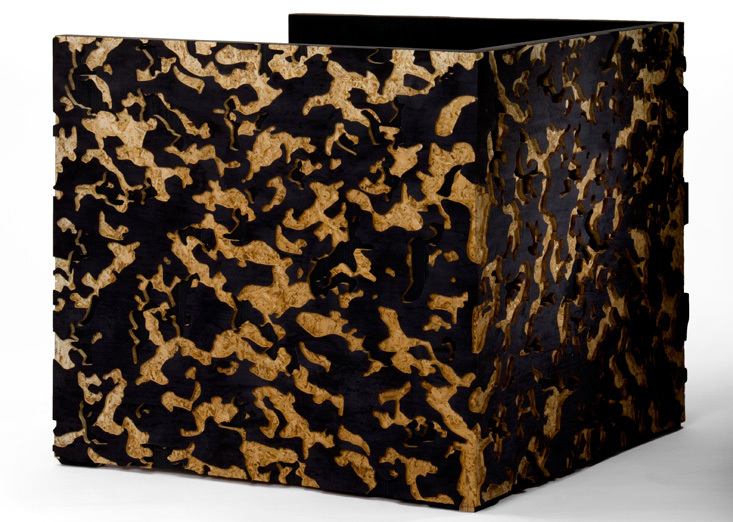 These panels feature a carved camouflage pattern that emphasizes the trench-like character of the piece, but at the same time expose the OSB beneath. As a window of truth, the carved texture denounces our pretensions, as well as open the discussion for the birth of new aesthetics using new materials. Engineered wood boards are generally a better choice in environmental terms because a larger proportion of the tree wood ends up in the finished product and they’re made from fast-growing, harvested softwood forests. OSB is particularly good in these terms, as it can be made with certified wood and low-VOC adhesives. 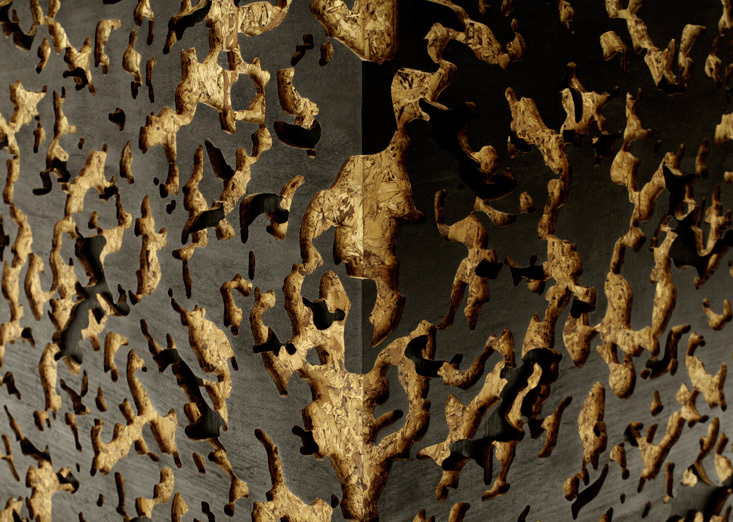 “Camouflage” values these materials for their environmental and aesthetic particularities.